These are two replicas of Renaissance majolica designs (1400) make in the 1700s, now housed at the French castle Usse. Two examples of Majolica with deep blues, one of the oldest colors, originally made with cobalt stone from the Middle East, ground into powder. I love majolica! Since the first moment I set eyes on it, I've made pilgrimages to majolica factories and annoyed countless potters and painters by watching them work and asking silly questions. then applying a tin enamel that upon drying forms a white opaque porous surface. Finally the piece is fired again. This type of ware was produced in the ancient Middle East by the Babylonians, and the method has remained continuously in use. 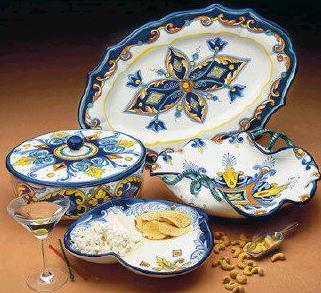 Each majolica-making region of Italy is rightfully proud of their over 500 year heritage. I found myself unknowingly offending some Italians by professing a preference for one region's pottery over another's. 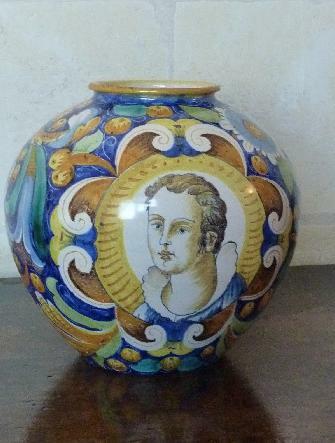 So be careful what you say to whom when talking about majolica in Italy! It can be an emotive subject. Just an extra note. The prices have sky-rocketed in recent years. Partly because of increased demand from abroad, and increased perceived value, and higher labor costs. But if you are in Italy, you can save much money buying directly from the factories. Pack the small items carefully, and you can bring them home yourself in your luggage. Here's a link to the history of majolica that covers the Etruscans to present day. And The National Gallery of Art has a whole section dedicated to the subject of majolica. Luckily for us, it is also on-line. To view their Italian Renaissance Ceramics Collection, click here or on the treasure hunter, an earlier version of a collector, to the right. There's a lovely description of the history of Italian majolica on a site dedicated to teaching the art of illumination. 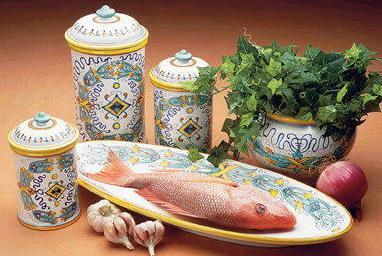 Their text is accompanied by beautiful examples of classic and modern majolica. Click here, or on the woman working her clay (no, it's not dough; I say it's clay! 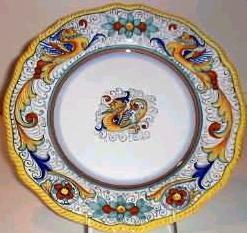 ), to the right, to link to the history of Italian majolica page. Click on the logo below to visit the website of a majolica shop on Nantucket Island in the U.S. state of Massachusetts. They have a wonderful 'Making Majolica' page in the 'About Majolica' section that is full of pictures of the whole process. 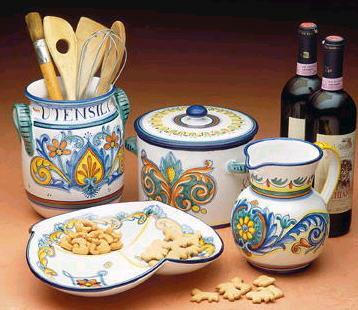 The Life in Italy site offers courses in making and painting majolica in Deruta, Italy. 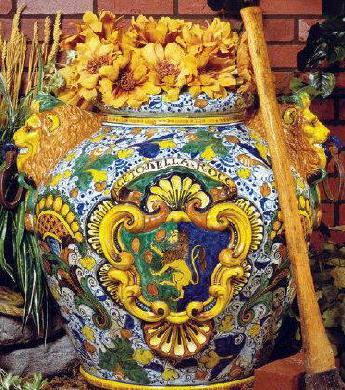 Deruta is one of the most famous majolica centers in Italy, famous for the Raffaelesque design you can see in some of the images to the left. To go directly to the information about Deruta, click here. To visit the main page of the Life in Italy site, click on the logo below. 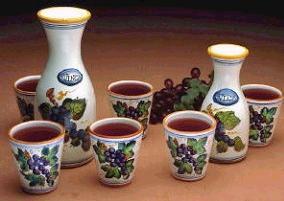 The site offers unique products and services like fresco painting, personal shoppers in Italy, Italian silverware, truffle products, and mosaics. 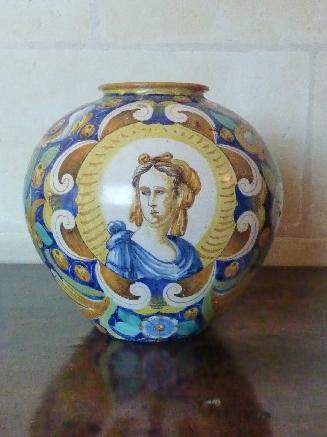 There are many collectors of majolica who search out designs painted by famous artists like Leonardo da Vinci and Michelangelo. If you are in Florence, you can visit the family home of Michelangelo, Casa Buonarotti, which is today a museum, and see several platters (tondi) that he painted for local wealthy families. The same bright colors on the tondi can be found in the newly cleaned ceiling of the Vatican's Sistine Chapel. The Casa has a very nice site in English showing all the rooms and the major works on display. 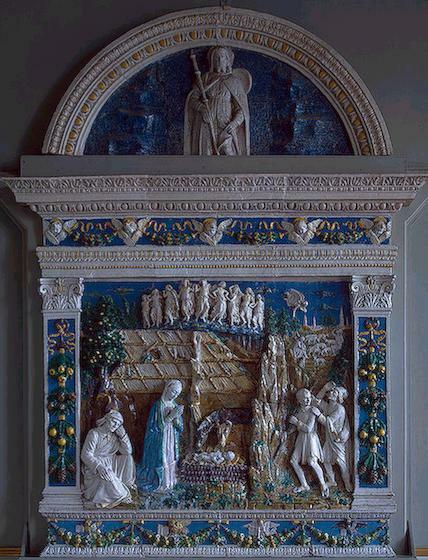 The greatest Italian artist using majolica was Della Robbia. He crafted delicate religious designs that stand the test of time. 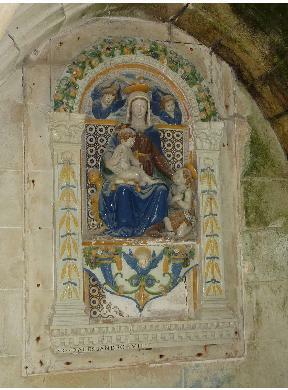 Here is a design from a Renaissance chapel in France, from the Usse castle estate. His designs were so popular, that his descendents lived by making reproductions of his work for generations. This 'Nativity' is also by Giovanni Della Robbia. It is in The Hermitage museum in St. Petersburg. 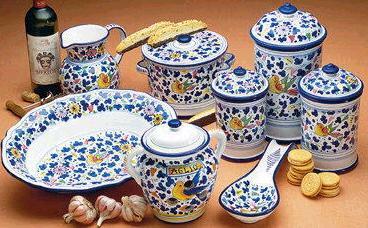 Majolica is not only made in Italy. 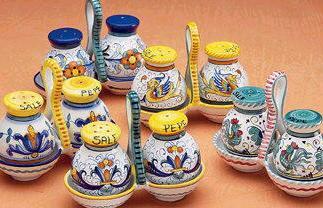 The name comes from Mallorca, an early transport site for pottery from Spain to Italy. 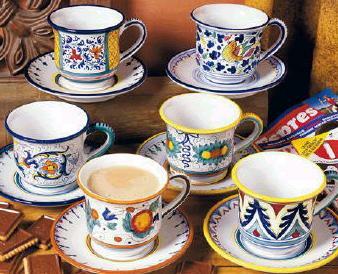 In France it is called Faience after the Italian town Faenza. In Holland it is called Delftware, or Delfts-Blau. 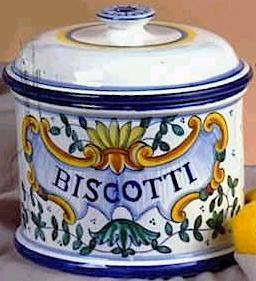 The English call it by it's Italian and French names, and have a very long history of making their own majolica. 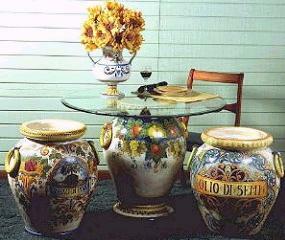 They are also avid collectors of old examples of English majolica. On one episode of the BBC's Antiques Roadshow, I saw the appraiser put a price of 60,000 British Pounds on a majolica commemorative drinking cup. The cup had been made to commemorate the ascension to the thrown of George the Third, in 1760, and the woman who owned it admitted that it usually sat on their fireplace mantle holding pencils and pens. You can see what books are available at Amazon.com about Majolica, what people's comments on the books are, and what they cost. To look up more specific books, you can use this Amazon.com Search tool. Just enter 'Books' in the 'Search' field, and, for example, 'majolica history' in the 'Keywords' field. Then click on the 'Go' button to see the list.